What is Houston famous for? At IAH Houston airport, there are several parking garages along the compound as well as Valets Parking. Opened at Terminals A-B/C/D/E. Check IAH terminals map here. All the terminal parking have Electric Vehicle Charging Stations. – Terminal A-B: Green and Purple Parking. The car park is shared and located between both terminals. Electric Vehicle Charging Station: it is based on Level 4 – A side. – Terminal C: Blue Parking. Have the Electric Vehicle Charging Station: it is located at Level 4. – Terminal D: Red Parking. Have the Electric Vehicle Charging Station: it is located at Level 3. – Terminal E: Orange Parking. Electric Vehicle Charging Station: it is located at Level 3 (D side). It is one of the comfiest and easiest ways to park at Houston airport with covered parking spaces. One day costs $26; the service is provided in all the Terminal Parking. The attends the vehicles and drivers (to pick-up and drop off the cars in the agreed place), free bottled water, newspaper, etc. Contact Phone: 1 281 233 3277.
eco park and ecopark2 are the most environmentally friendly shuttle fleet at Houston Airport. Shuttle service operates 24/7 all the terminals. Ecopark it is located a little bit far away from the terminals, and it is needed a method of transportation to reach any terminal. In particular is located south of the Tower, behind the Rental Car Facility and the Courtesy Shuttle to all Terminals. Ecopark two is found close to the administrative buildings. The eco park parking garage can accommodate oversized vehicles -maximum height: 11’9″- such as large trucks, campers, etc. Entrance location: north gate located off JFK Boulevard’s feeder road. – Up to 3 hours: Uncovered Parking Space: $2.77 + tax. – From 3 to 24 hours: Uncovered Parking Space: $5.54 + tax. SurePark Advantages: Private entry / Guaranteed parking space / Covered parking space / Close to terminal / Fast and easy to park /. A $50 refundable deposit for the card is applicable, in addition to a one-time non-refundable application fee of $200. Both fees are charged to your credit card upon receipt of the application. 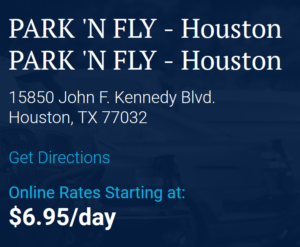 Park ‘N Fly at Bush Intercontinental Houston Airport (IAH) brings you more than just airport parking services. Our hope is to create a better experience by offering add-on services that ease your travel concerns and save you valuable time. One visit with Park ‘N Fly and you’ll know why we are the #1 destination for IAH parking. We now offer Texas Sized Spaces™ for customers who wish to have a little more room to park their car or truck. These spaces can make you feel like you have Monster Truck Sized Space and give you the widest airport parking spaces you can find! Is Houston close to the ocean?